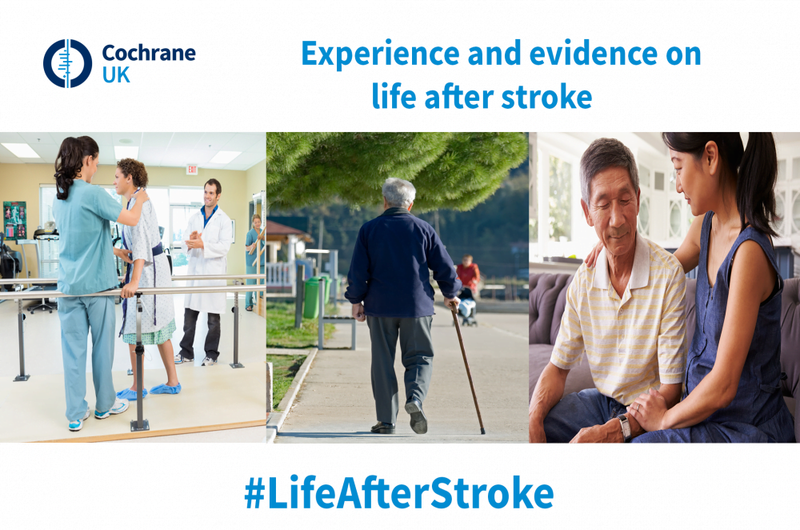 Sarah Chapman introduces #LifeAfterStroke, Cochrane UK’s special series of blogs, and other material, that will include Cochrane evidence, ongoing research and the perspectives of stroke survivors, researchers and health professionals on life after stroke. I doubt you need me to tell you that stroke is common. In England alone, every year, around 100,000 people will have a stroke. When we first thought about having this special series, stroke was a priority for the Department of Health. Their ten-year National Stroke Strategy ended in December 2017 and, whilst it led to real improvements, including large reductions in stroke deaths, there’s still so much to do. Following a campaign by The Stroke Association, it was confirmed in Parliament in December that the government has committed to a new national plan for stroke, which is being developed by NHS England together with The Stroke Association. Great news. 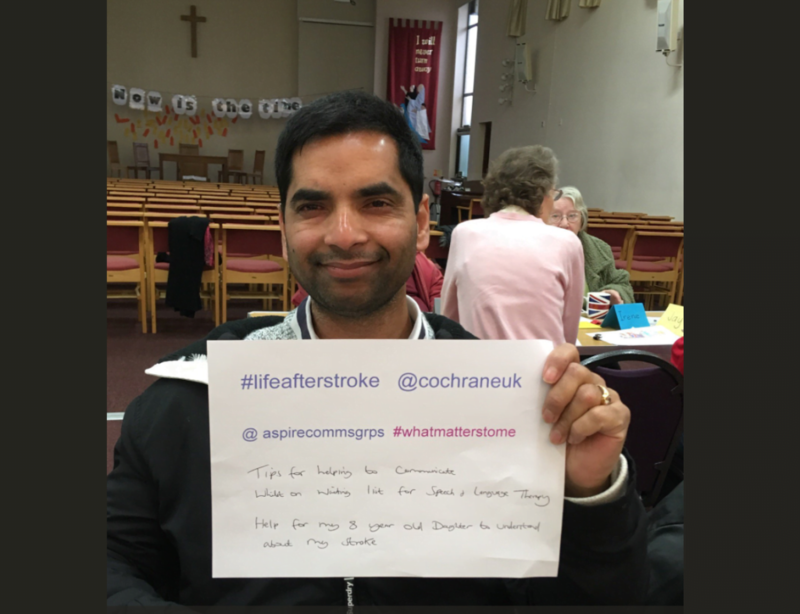 You can read The Stroke Association’s campaign report here. We are rightly hearing more and more about the importance of using precious resources wisely and avoiding research waste. One example of work that can help direct research funding to the questions people most want answered is that done by the James Lind Alliance Priority Setting Partnerships (PSPs). Patients, carers and health professionals work together with researchers to establish identify and prioritise questions that research needs to address. You can see the top 10 priorities for stroke research from the Stroke in Scotland PSP here, and we’ll be linking to these as we go through the series. 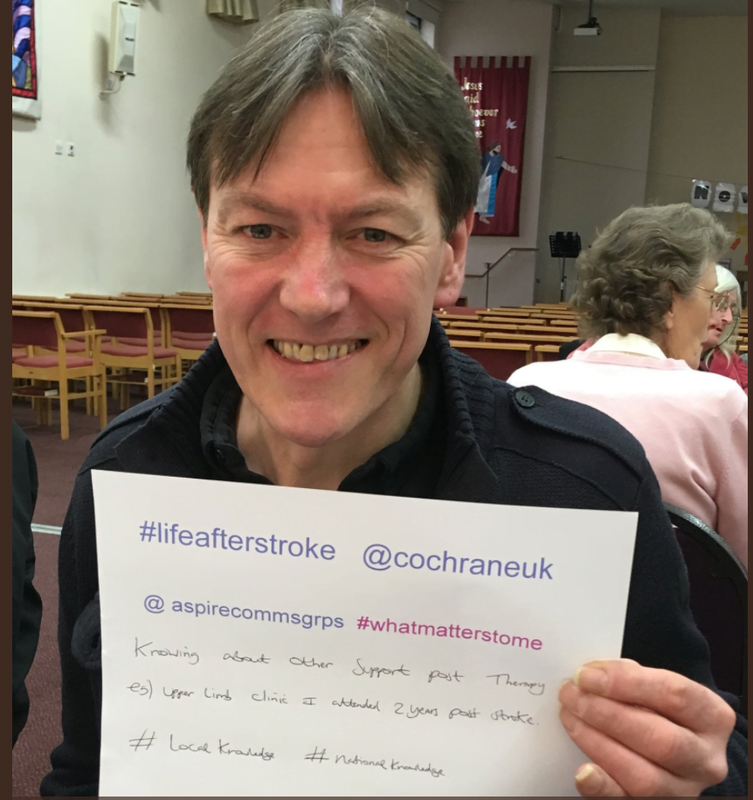 We asked people on Twitter to tell us what matters most to them about life after stroke. We heard from a Speech and Language Therapist who wanted to hear more about recovery after six months and the key factors in this recovery. 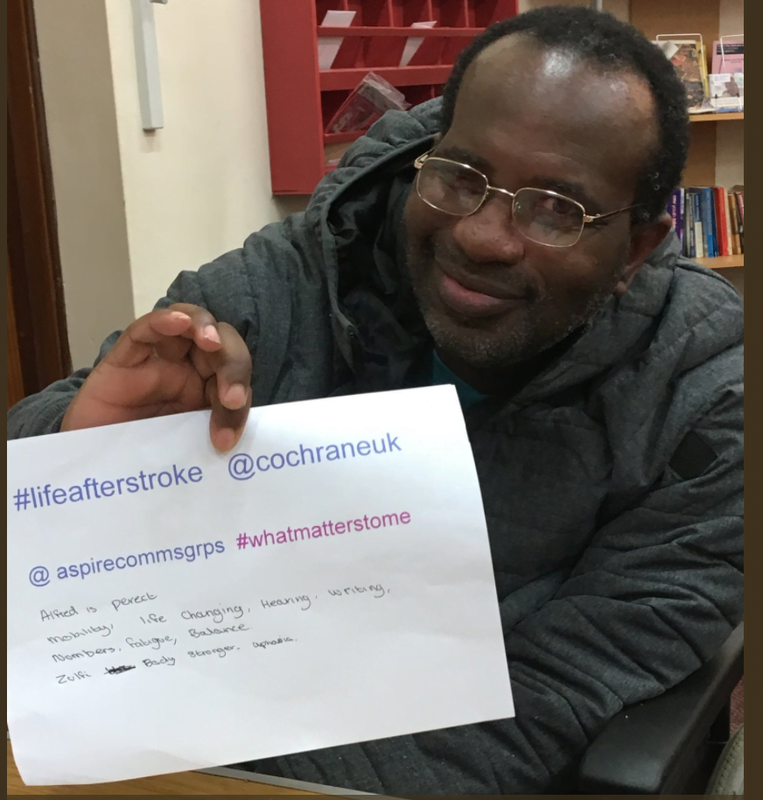 Stroke survivors and carers or relatives who are part of the ASPIRE Communication Groups (@ASPIRECommsgrps), support groups for people living with communication difficulties after stroke, tweeted us their photos and suggestions. These and other stroke survivors told us about wanting to know about available support – for themselves and for carers; new treatments and technologies; how to improve things that had become a struggle – writing, hearing, speech… They wanted to know how to reduce fatigue; to become stronger; and how to avoid having another stroke. They are looking for hope and for inspiration, examples of things other stroke survivors have done that they have found helpful. @PaulaSmejka, whose husband is a stroke survivor, said she’d like to see ‘how to’ films showing stroke survivors completing tasks one-handed, and also tips for supporting communication. Paula also raised the issue of how help stroke survivors find meaning and purpose in their lives after stroke, and I think this will resonate with many people. I’m always humbled to see how many people, amidst the disaster of a life-changing illness, find new ways to channel their skills and energies, and to use their new experiences, to help others – whether that’s through raising awareness, fundraising, or participation in research. There’s a call right now for people affected by stroke to join a Service User Review Panel. Among other things, panel members influence how research funds are used and advise researchers as they develop their projects. Do take a look if you think this might be for you. Some of you may have read a previous Evidently Cochrane blog in which Annette Dancer, a stroke survivor, gives a powerful account of what living with dysarthria (unclear speech) after stroke is like for her, and researcher and Speech and Language Therapist Claire Mitchell writes about their research on treatments for dysarthria. Claire and Annette are working together on research into the feasibility of a computer programme for helping people with dysarthria, and they have written a new blog on why working together, with their different expertise, makes for better research. We’ll also have Annette’s story of regaining confidence and on the surreal side of life after stroke. Another stroke survivor, Caroline Carus, writes about the impact of stroke, “a sideswipe across what my life had been”, in her blog “I miss me…”. This is a compelling piece of writing; don’t miss it. We have some great blogs on evidence and practice from allied health professionals, as well as Claire’s, with blogs on occupational therapy for stroke by Rose Peel, on physical rehabilitation by physiotherapist Mike Smith, and from another physiotherapist, Julie Duncan Millar, who decided to do something (with the help of people affected by stroke) to improve research into upper limb rehabilitation. We also hear from neuropsychologist Marta Bienkiewicz about cognitive rehabilitation after stroke, making a plea for better research. We’ll be publishing blogs each Tuesday and Thursday from 6th March and sharing lots of relevant evidence summaries on social media throughout the month. 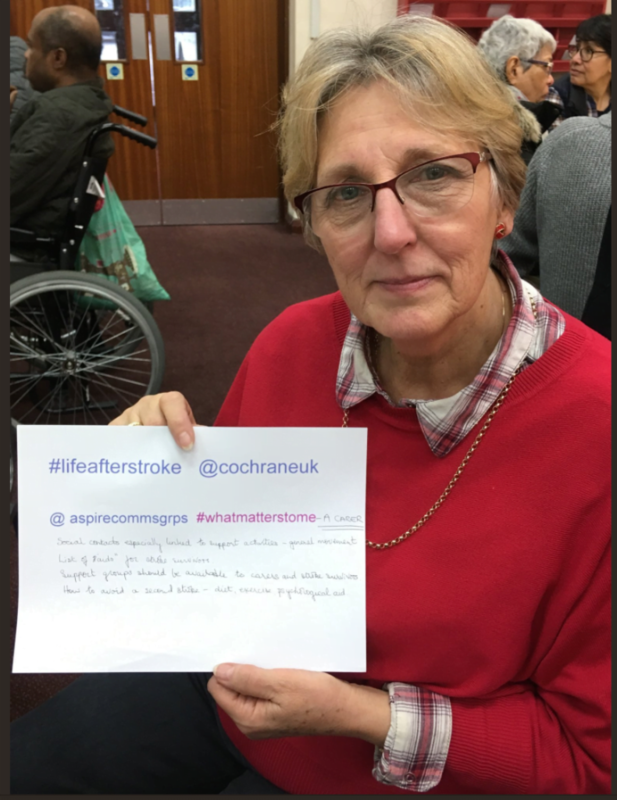 Do join in the conversation, by leaving comments on the blogs or talking to us on Twitter @CochraneUK @SarahChapman30 @CochraneStroke #LifeAfterStroke. 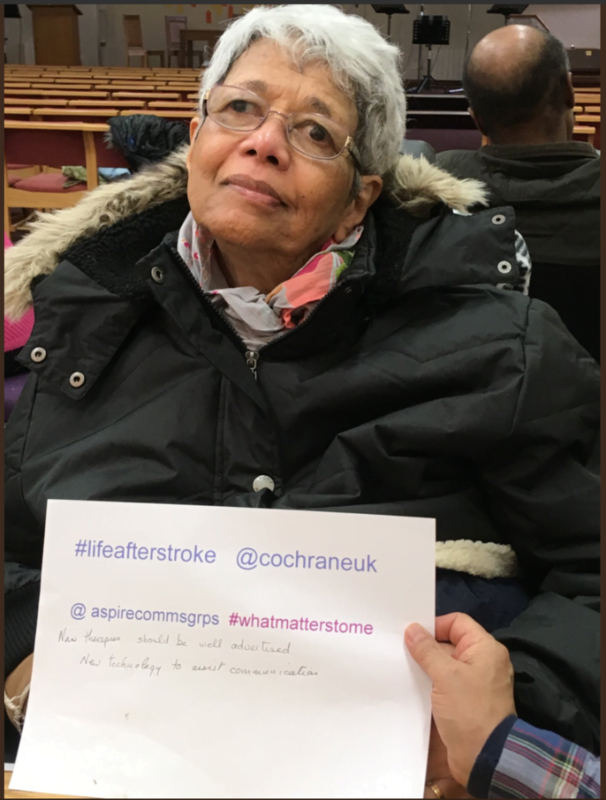 Things that matter to this carer, Irene, include access to support groups for stroke survivors and carers, and avoiding a second stroke. As the founder of cancer nonprofit Annie Appleseed Project, I have always focused on the ‘natural’ (i.e. non-pharmaceutical) approaches to disease. When I was diagnosed with breast cancer in January 1993, one of my closest friends had just become an acupuncturist. I had never experienced, nor did I know anything about Traditional Chinese Medicine. She told me that there were excellent outcomes after stroke (the sooner started, the better). One of my major complaints is that the Western medical system tries to fit square pegs in to their round holes every day. And then is able to ignore all that does not fit. (I am a Cochrane Consumer and have commented on this since 2006). What it ends up meaning is that studies are NOT done on how acupuncture WOULD FIT. This is a great loss for the millions of stroke victims. How can I get your above info in a bigger fontt? Am trying to read with a magnifying glass and also font so tiny when writing this I cannot see my words or spelling!!! Liiving in Canada – can we be part of your new info? Have a friend who had a left-sided stroke 4 months ago. Has learned to walk again and has feeling in left arm but no use of it.. Is home from hospital now / several really good friends who are supporting her on a daily basis. I have been doing some massage and gentle range of motion movements of arm but her physio (seeing him once a week) has said we shouldn’t be doing massage unless trained. I can’t see that we can do any harm (don’t know if he has a plan or given her any hope of regaining use of it.) I am also suggesting guided visulizational meditations. Suggestions / reading materials please.